The Lampidis Cancer Foundation was established to help highlight and fund the groundbreaking cancer research of Dr. Theodore Lampidis, and enable Phase II clinical trials of 2-DG so that this revolutionary treatment protocol can begin to help those suffering from various types of cancer. The fundamental theory of Dr. Lampidis research is to trick the hypoxic (non-oxygen consuming) cancer cells found deep in the heart of a cancerous tumor to ingest a fake sugar (a form of glucose called 2-DG) which causes the hypoxic cancer cells to starve and die. Dr. Lampidis is Professor at the Department of Cell Biology at the University of Miami Miller School of Medicine and a member of Sylvester Comprehensive Cancer Center. For the past 13 years he has focused his research on glucose tumor metabolism with a single-minded purpose that he describes as follows: “I am convinced that the biochemical principles at the heart of our work are as fundamental as gravity. That is why I believe investigating tumor metabolism in general and glucose metabolism in particular, will lead to significant and real advances in the struggle we all one way or another face in fighting this devastating disease." The National Cancer Institute stated in the reviews of his research that “Dr Lampidis’ work could eventually lead to cures in certain cancers.” Based on his work, an FDA approved Phase I clinical trial was conducted to determine the tolerable dose level of 2-DG. Before they progress to a Phase II clinical trial, further work is required to investigate and develop the most effective combination treatments and drug delivery method. The University of Miami Leonard M. Miller School of Medicine is a powerhouse of cancer research and Theodore Lampidis, Ph.D. is one of its stars. He is a pioneer in the exploration of the intricate metabolism of glucose in cancerous cells and the discovery of targeted cancer-specific metabolic treatment modalities to exploit the process. Dr. Lampidis graduated from Brooklyn College with a bachelor’s of science degree majoring in chemistry and received his master’s degree in medical microbiology from New York University. He received his Ph.D. in immunology and microbiology from the University of Miami and completed his postdoctoral training at Harvard Medical School in the Department of Medicine, Division of Oncology. He came back to Miami and joined the Department of Oncology at the Sylvester Comprehensive Cancer Center at UM as an Assistant Professor in 1983 and attained the rank of tenured Professor in 1995. He has had an outstanding record of almost continuous NIH/ NCI funding for his work in cancer for the past 35 years and has been an invited speaker to many prestigious cancer institutes throughout the world including Oxford University in England; the Max Planck Institute in Munich, Germany; The Paul Brousse Institute in Villejuif, France; Wolfson Institute for Biomedical Research, University College London, England; Harvard Medical School in Boston, Massachusetts; The Albert Einstein Cancer Center and The Sloan Kettering Cancer Center in NYC, NY; The MD Anderson Cancer Center in Houston, Texas, and a host of others. His work at UM has gone from the lab to the clinic resulting in investigator initiated Phase I and Phase II clinical trials. In 2016, Dr. Lampidis received a Congressional Record in honor of his work studying the combination of 2-DG and Fenofibrate to deliver a non-toxic cure for cancer. Want to make a meaningful difference in the fight against cancer? Learn more about how you can support or join the team at Lampidis Cancer Foundation. 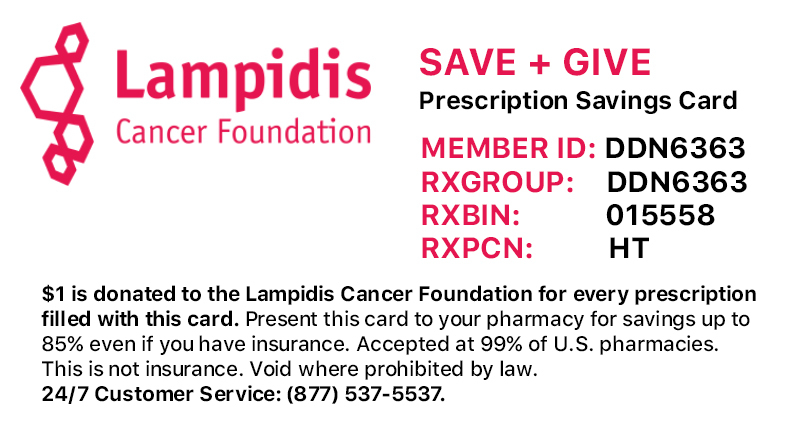 $1 is donated to the Lampidis Cancer Foundation for every prescription filled with this card. Present this card to your pharmacy for savings up to 85% even if you have insurance. Accepted at 99% of US pharmacies. Copyright © 2017 Lampidis Cancer Foundation All Rights Reserved.